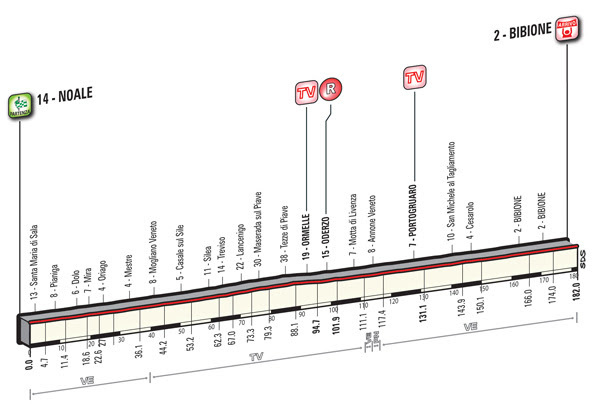 Stage 12 of the Giro d’Italia, 182km from Noale to Bibione. The stag is entirely flat, and a bunch sprint is expected. Noale: Rain, 15°C. Wind: moderate – 10kmh. Bibione (approx. 17.10 – Finish): Rain, 16°C. Wind: moderate – 14kmh. During the stage, time bonuses of 13 seconds are up for grabs. A maximum possible 90 points are available for the points classification. No King of the Mountains points today. The stage course is perfectly flat and runs almost entirely along wide and straight roads. Initially, the route follows the Riviera del Brenta, then it enters the province of Treviso along trunk roads. There are roundabouts, kerbs, speed bumps and traffic dividers in urban areas, especially in Mestre, Treviso and Portogruaro. The route finally reaches Bibione, where an 8km circuit is to be covered twice. The final 8km circuit, to be ridden twice, features 14 bends and long straight stretches, on mostly wide and well-surfaced roads. The home straight is 300m long, on a 7.5-m wide asphalt road.